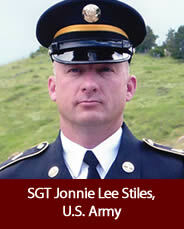 If you knew Jon Stiles at all, you knew that love for his country came above all else. His unwavering commitment to our country started at a young age, enlisting into the United States Marine Corps at just 19 and he served seven years. Jon tried the civilian world, but he had to get back to his true call. He enlisted for a two-year stint in the Army. Later he joined the Colorado National Guard in early 2007. Jon served on the Honor Guard at Fort Logan National Cemetery. He held this position in high regard, believing that burying a fellow service member is a position of admiration and respect unlike any other. Craving to do more, Jon looked for deployments with units nationwide, finally landing one with the Louisiana National Guard to Afghanistan. He would always look after his men first, putting their safety above all else. This was especially evident in October of 2008 when he pulled two fellow Soldiers from a burning Humvee. Though he sustained damage to his vocal cords and lung damage, he refused anything more than a 30 days medical hold, in country. For his heroic actions, he was awarded a Bronze Star. Refusing to leave his team, Jon went on a mission on the 13th of November in Jalalabad, Afghanistan, when an IED took his life. Though he is painfully missed on a daily basis, our hero died doing what he loved. We are so very proud of him, his dedication, his pride and commitment to our country.